Are you tired of changing cassettes and receipt paper in the freezing cold? Are you sick of managing drop offs from your cash fulfillment company? 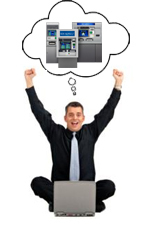 Are you exhausted of high priced ATM Compliance issues year after year? If so, Case Financials Managed ATM Services Program may be right for you! Our Managed ATM Services Programs are a comprehensive outsourcing solution for all of your ATM requirements. The concept for our program, stemming from years of experience managing and maintaining our own ATM portfolio, is simplification through integration of all ATM services utilizing a single provider. Essentially, Case Financial can assume responsibility for every facet of owning and operating an ATM fleet on behalf of your organization. From purchasing the equipment, to keeping the ATMs compliant (ADA, EMV, PCI), to cash replenishment, and everything in between, we can handle it all! Almost as quickly as you can say the word “outsource,” all of your headaches associated with owning, maintaining, and operating your ATM portfolio will vanish into thin air. For more information on Case Financials Managed ATM Services Programs, please feel free to download our informational brochure and contact us Toll Free at 1.877.728.9627. Please visit our Contact page to request more information about Managed ATM Services.